Two Years At Sea (Ben Rivers) – Geographical Solitude and Company in Objects. Cause and effect may not perhaps be the first aspect that comes to mind when considering Ben Rivers’ feature debut Two Years At Sea (2011). Yet, looking at the implications of the lifestyle on show, itself a deliberate effect of causation from working at sea for two years to be able to afford to live a more isolated life, there is a great sense of chains when looking at the thoughts and actions of its main protagonist. Discussing Two Years At Sea in a fictional sense is somewhat difficult. This is chiefly because it includes so much of its character’s real life as well as overtly obvious fictional moments. While the lifestyle that Jake leads (played by, if that is the right term of phrase, himself) is obviously real to a certain extent, other scenes with floating caravans and fishing on home-made rafts are not. This ambiguity is what the film thrives on but also what makes analysis of it tricky. Is it necessary to distinguish between the real Jake and the fictional elements that Rivers puts in? For the sake of this essay, it is assumed that it isn’t as the elements about to be discussed are a mixture of obviously real intentions and exaggerations of aspects already shown to be clearly from the real world. The interpretation of our reality through patterns not our own, serves only to make us ever more unknown, ever less free, ever more solitary. – Gabriel Garcia Marquez. Two Years At Sea presents the viewer with Jake; a solitary character whose own isolation appears to lead to a contentment rarely seen in film. His happiness is quiet and subtle, rarely seen to rise above more obvious, clichéd levels of happy endings. This contentment appears very clearly to stem from the character’s own, self-imposed isolation high up in the beautiful mountains and hills of Scotland. The film cuts up Jake’s life showing it to be far more isolated than it is in reality. As Jake drives his jeep around, the viewer knows deep down that he must be, in some way, earning money for the petrol. This implication is ignored in the film but for very specific reasons. The fantasy of Rivers’ film is in the idealisation of solitude. This basic essence of living is found in a number of different works of art, specifically in Mary Shelly’s The Last Man, where the main protagonist is left in an empty but beautiful world at the end of the novel; entirely uncertain whether the loss of everyone he loves is a burden or a blessing. 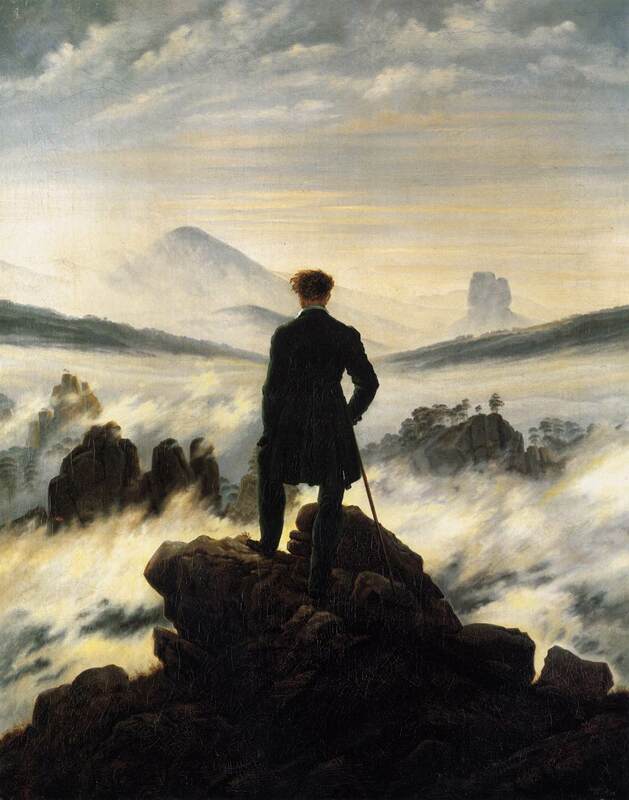 Jake’s life also shares some resemblances with Casper Fredrich’s The Wanderer Above The Mists (1818); a romantic vision of Victorian solitude not unlike a period version of Jake’s life as presented in Two Years At Sea (the artwork also adorns the cover of Shelly’s novel). Rivers does not wholly acknowledge the outside world because its effect on the fantastical elements of the film would be to make them redundant. Jake simply must be alone and in isolation in the countryside for the romanticised vision to form. Of course the film cannot tell of Jake’s true life job as a substitute teacher. The romantic notions arise because the inherent “give and take” nature of modern, capitalist society has been removed. We must work five days a week of something that is often unpleasant for the two days a week off and the occasional holiday. Jake’s life-plan has meant that this has been by-passed within the film. Jake’s solitude creates the fantasy that this idyllic, rural life is achievable if one does work for “two years at sea”. That is not to say however, that all of this is fantasy. In fact, in Rivers’ short film about Jake, This is my Land, he is shown to be just as content without any help from fictional elements. Rivers takes the upmost pleasure in filming Jake pottering around his land, often to more warmly amusing effects. The self-inflicted solitude sounds more like burden when described in such a way. It is however, a very clear ideal designed to show the joy in the most simple of pleasures. Company in Objects and Music. The solitude in Two Years At Sea may itself be an effect (of the cause of working for the title’s allotted time and place) but it is also a cause to more interesting effects. While it may be desirable for many to have complete solace, there’s very little that can be predicted about how people would react. Solitude in films often lends itself more to the likes of horror with films such as The Shining (1980) and Secret Window (2004) implying that the state is not only bad for the mindset of a person but that its effects are negative and can impact on people who break the solitude. Rivers’ film does not in any way do this. Instead it shows a more interesting scenario; finding company in the more abstract of objects. While Jake is shown to have a cat (in both the feature and the short) he spends much of his time tending to objects and the environment around him. His tending of the forest for wood or making bird feeders out of old milk cartons implies a warm friendship and admiration of the world around him. This idea sounds twee and almost farcical on paper but this idea allows the film’s most surreal elements to occur. Almost as a practical joke played on an old friend, the forest appears to lift one of Jake’s caravan’s up to the top of a tree whilst he is still inside asleep. This solidifies the relationship between Jake and world around him, showing the effect of the cause of solitude. The objects aren’t the only break from the solitude. Jake’s relationship with music is shown to be another cease in the isolation, giving him the only potential sounds made by other people. His own isolation becomes one, not from the world around him, but very specifically from people. This allows the music to have a special place in the film as it plays loudly on Jake’s charming homemade set-up. It is also fitting that Jake still uses the analogue methods of listening. He plays vinyls and the tape-deck in his old, battered land rover. This physical nature allows the music to still be a physical object; an aspect vital to easing in the solitude. With music becoming a physical presence that can be turned on and off, the company it provides is also able to be switched off showing a pleasing ideal many would wish to emulate in more traditional forms of life. Two Years At Sea shows a very clear cause-to-effect movement. Unlike other films that deal with solitude, (even more positive films such as Into the Wild (2007) or Life of Pi (2012)) Rivers’ film is entirely romantic and content, heightened by the completely stunning visuals of the 16mm Bolex that evokes nostalgia and optimism in a situation that is so often portrayed with negativity. Distant Voices, Still Lives (Part 3) – Music, Memory and Society. David Lynch’s Musical Formations of Cinematic Ideas (The Big Dream).